Alisande serves as the geographic services coordinator. She directs our growing baseline documentation report service and prepares maps to illustrate property boundaries and conservation features for landowners to use as they develop the terms of their easements. In addition, she is a key member of the donor support system. Working with easement donors’ tax advisors and the Virginia Department of Taxation, Alisande coordinates the preparation of the tax benefit registration document. 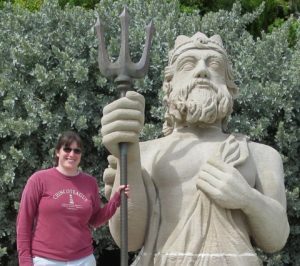 Alisande with Neptune at the National Museum of Bermuda. A: I was born in Blacksburg but moved to North Carolina while my dad finished his graduate degree. We then moved back to Virginia. I currently live in Lexington. A: I used to always say purple but now I prefer blue. I enjoy the cool colors. Q: Do you have any pets/animals? A: I have a dog named Gertie Sue! Q: What interests/hobbies do you have outside of work? A: I really enjoy gardening, especially introducing native plants. I also enjoy DIY projects when time allows. I love spending time with Gertie Sue- playing and going on walks. I also really love exploring the wine/beer trails of Virginia! Q: What is a fun fact about you that most people don’t know? A: I would say I am not a bad cook, haha! Q: When did you start at Conservation Partners? A: I was brought on as a seasonal worker in November of 2007 and came on board full-time the following January. I mostly work on GIS/mapping for CP but also work on tax registration and assisting the donation process. Q: What has been your favorite part about working at Conservation Partners? A: I love creating the Property Maps for all the landowners we work with. Throughout the years I have learned more about the state of Virginia like identifying counties, topographical features, etc. My academic background was geography so that passion has continued into my role here. Q: What has been the biggest challenge you have encountered at this job? A: I would say probably providing the services we do with limited resources. We are a small, private company and don’t always have the newest, most updated technology but we do a good job working with what we have and making sure we provide the best service possible to our landowners. For more information on property maps, BDRs, or tax registration documents, please reach out to Alisande at atombarge@conservationpartnersllc.com or by phone at (540) 464-1899 ext. 4.